Western Power workers making adjustments after fitting a new generator following the oil spill. 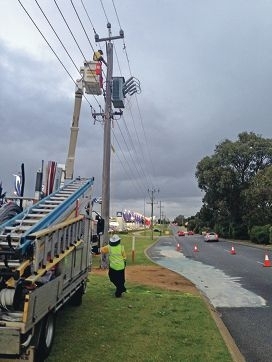 Oil leaked from an old transformer, which Western Power had to replace, forcing the closure of the left lane on Wednesday afternoon. The oil, which is used to cool and insulate the transformer, was covered on the road by a special white absorption powder.